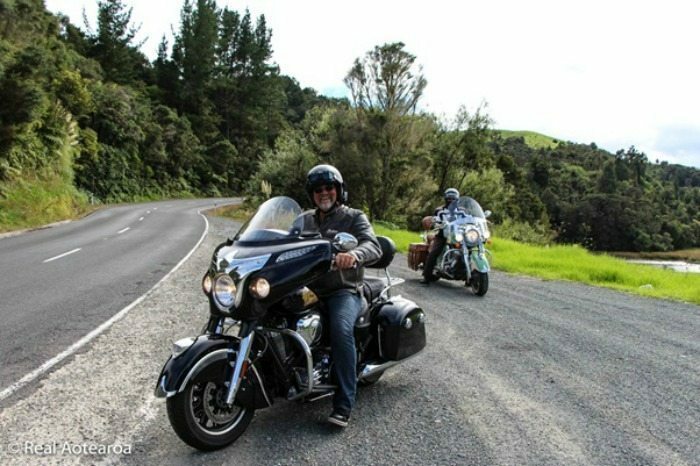 Home / Rides & Events / Motorcycle Adventures / 9 Days of Living the Dream in New Zealand! I love showing our beautiful New Zealand off to our guests, and this tour was no exception. It had been a while since I enjoyed the roads of the far north and what a thrill to be back on them, it’s like they’re made for the big Indian Thunder Stroke 111 V-Twin. In saying that, the Indian Scouts were certainly having a ball, I just didn’t see much of them as they went past me and disappeared around the next bend time and time again! 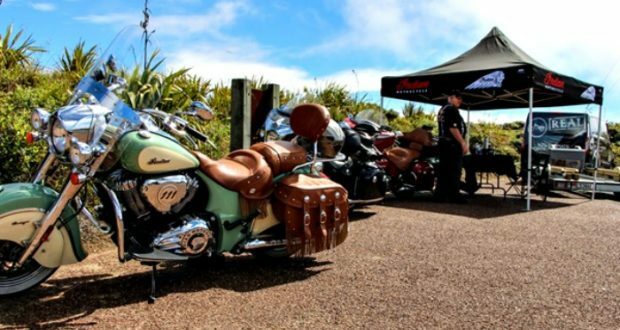 The ride started in Wellington with around 80 odd bikers meeting up for breakfast, before heading north to Taupo and New Zealand’s first Indian Motorcycle Rally. This day ride ended up being 100kms longer than planned due to major spill on SH1, which meant an awesome detour around Mt Ruapehu (an active volcano in the centre of the Island) and National Park roads. The Rally went off without a hitch, my full compliments to the organisers for a well-organised event. 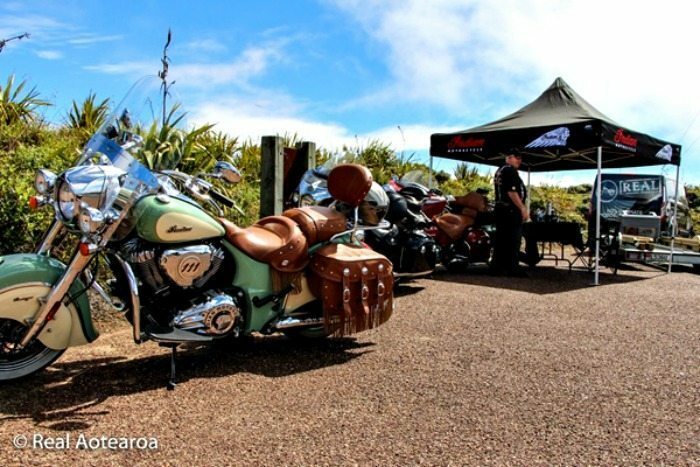 It was great meeting up with riders from all around New Zealand and overseas. In fact, Wayne (one of our tour guests) had travelled from Perth, Western Australia. He’d had to leave his new Willow and Ivory Roadmaster at home and reckoned had it been there he would have taken out the top bike prize. As it was, a pretty awesome tricked up Scout came out on top. After a couple of days talking bikes and riding, the feel amongst the tour group was ‘let’s get into it and do some real riding’. 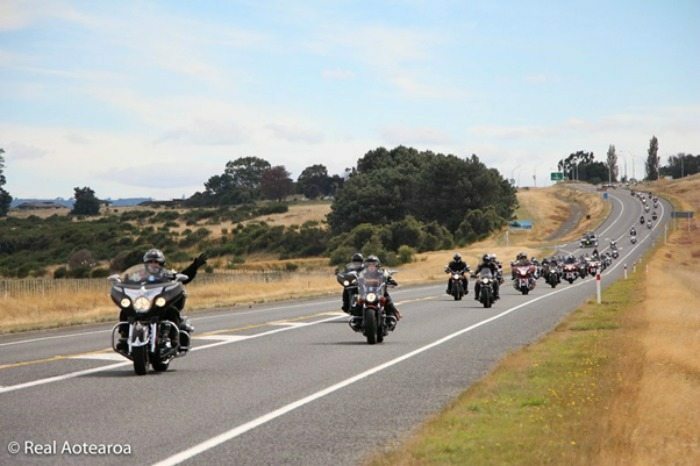 Ride we did, alongside the rolling hillsides and forests leading to Rotorua then through thick green bush and beside the many lakes leading to the East Coast, before heading north and settling in the small mining town of Waihi. After a fun night and a good night’s sleep we headed north to Whangaparaoa (just north of Auckland). The plan was to get through the city mid afternoon and miss the traffic (it sort of worked! Yeah right! 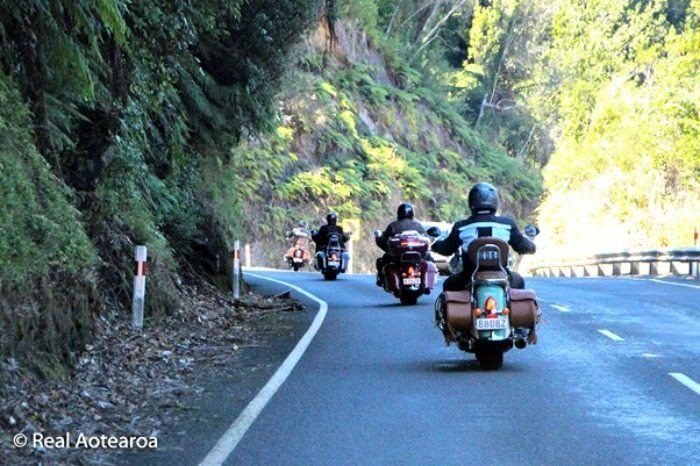 ), but not before we had taken in some of the beautiful roads and scenery of the Coromandel. Note to self, allow more time here – it’s amazing! Day 5 and wanting to continue north on less travelled roads, we took SH16 and weren’t disappointed. 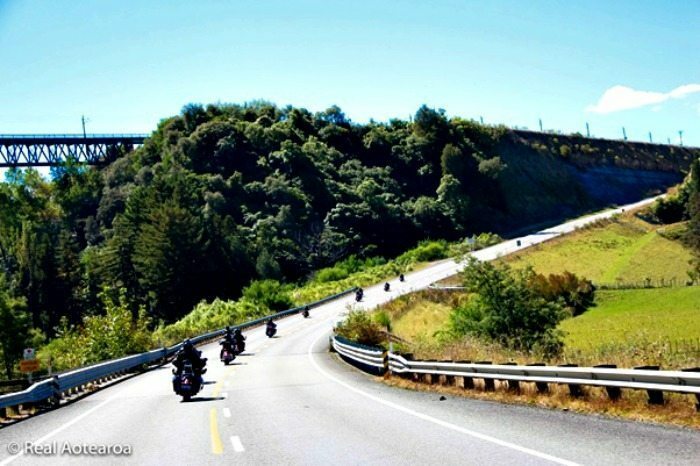 What an amazing ride with beautiful rounding roads, small towns and meeting friendly locals along the way – and when you think it couldn’t be better than this, along came the Twin Bridges Forest Road. Wow. This was full of truly stunning curves and twist backs, bush so thick we were riding under canopies of fern and natives for much of the ride before arriving in Kerikeri. 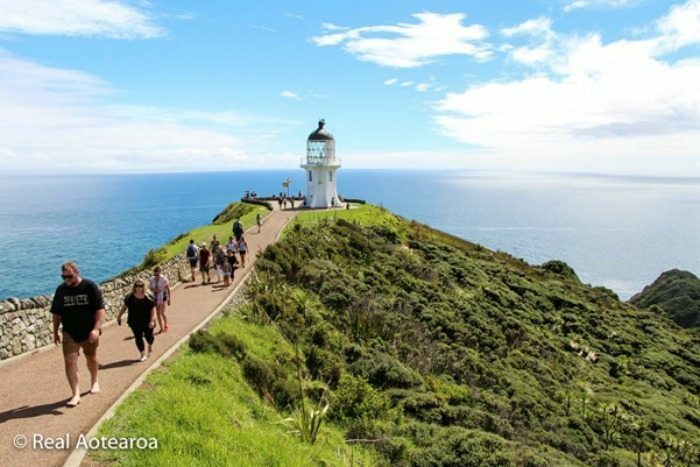 The next day we headed for Cape Reinga (the northernmost tip of New Zealand). It had been a while since I’d ridden this road but remembered it being a goody; It wasn’t just good it was brilliant! 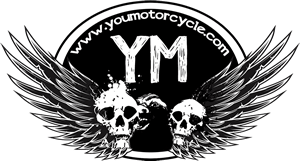 The roads cambers, curves and my Indian Chieftain worked together to create what for me was an amazing sense of freedom and being one with your surroundings as you gently twisted the throttle of the big twin. The Cape was great, the blue and green of the Pacific Ocean and Tasman Sea colliding as spectacular as ever. The ride back to Mangonui for the night only tipped by the fun had around the swimming pool at our harbour side lodgings. The following day we were booked in at Paihia only 80 km as the bird flies, but with roads like this we took the long way through valleys and forest, and more of small town New Zealand. We even got to cross a harbour on the Hokianga Ferry, which was great fun before finally arriving 260 km later at our hotel right in the centre of this coastal paradise that is the Bay of Islands. The following day was a rest day that ended up full to the brim with sightseeing at the Waitangi Treaty Grounds and the Hole In The Rock – my favourites. Like any great ride, before you know it the adventure is over, until next time that is! Reluctantly it was onto SH1 and off to the big smoke and International Airport to farewell our guests, now friends from over the ditch. The ride back to Auckland was great fun with good roads and some truly beautiful views of the coastline. It felt sadly normal after the challenges and excitement of those empty back roads. But then the memories of the ride kicked in and brought a smile to my face leaving a feeling of satisfaction at the end of another brilliant ride! I have a trip planned for new zeland this summer, I cant wait. Some of the pictures you took are breathtaking. Good for you. It seems that you really had a great time in NZ! I will visit the country soon.